Osprey is best known for making exceptional backpacks designed for hiking, backpacking, and adventure travel. In fact, the company's Atmos series of packs is so good that I've taken mine with me on trips across six continents. But the company also makes a line of fantastic luggage as well, and recently I had the chance to test out the new Shuttle 100 model, which I found it to be a high quality product with lots of thoughtful touches designed specifically with active travelers in mind. As the name implies, the Shuttle 100 has a carrying capacity of approximately 100 liters, which is a surprising amount when you consider most backpacks that we use for travel are in the 50-60 liter range. The bag is 30 inches (76.2 cm) in length, and is made from high quality fabrics and other materials that provide a nice sense of security and protection for even the most fragile stuff that you'll store inside. This is a piece of luggage that actually feels like it could be abused by the airlines, and come out looking none the worse for wear. Better yet, you get the sense that its cargo will be largely undisturbed and well protected too. 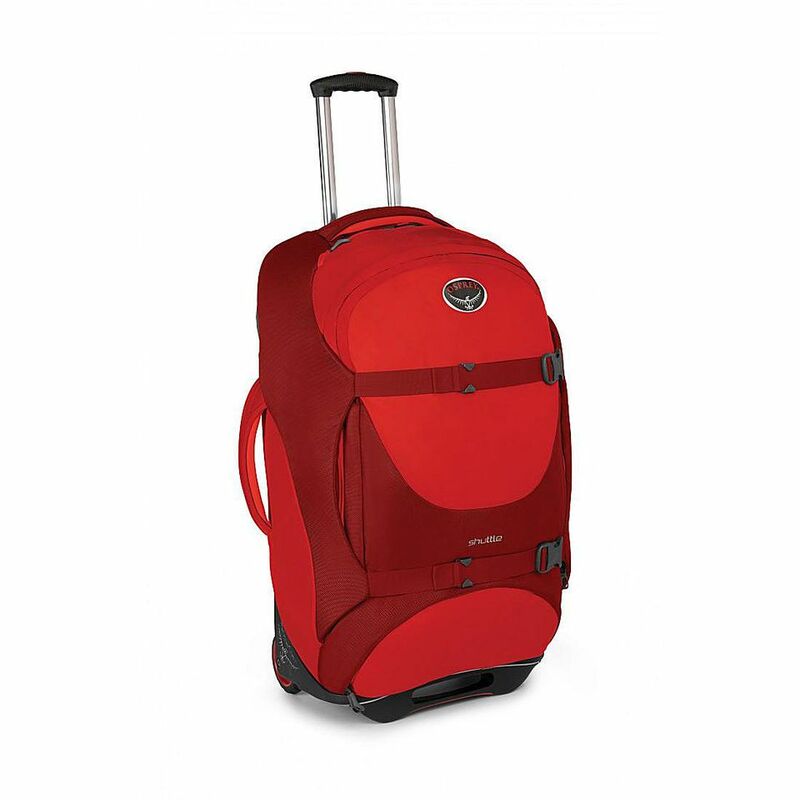 All of the bags in the Shuttle line feature large, very durable wheels that allow them to roll along through airports, hotels, and city streets with ease. I tested mine not only on smooth pavement and carpet, but also in the great outdoors while crossing snow-covered sidewalks and along icy roads. In both cases, the luggage performed as if it was built for off-road travel. The wheels didn't miss a beat when transitioning from a wide variety of surfaces that ranged from completely dry to thick slush to completely ice covered. If it could handle those conditions without a problem, chances are it'll take whatever you can throw at it too. The bag also comes equipped with a very durable aircraft-grade aluminum handle that allows travelers to pull it along with ease, even if it is stuffed to the gills with gear. I tested the Shuttle 100 with both a very light load, and an extremely heavy one, and had no problems wheeling it around, even through the variety of conditions and surfaces mentioned above. The handle is very comfortable to hold on to, and it allows for a firm grip on the bag, which translates to a great deal of confidence when you're on the go. If I had one complaint however, it is that I wished the handle was just a little longer, as there were times when I could have used a bit more space between the bag and my feet as I rushed along through the airport. Inside, the Shuttle is incredibly spacious, providing plenty of room for adventurous travelers to carry lots of gear. It's main compartment is huge, which makes it easy to stay well organized, even on longer trips when keeping everything in the proper place becomes more of a challenge. As a bonus, that same compartment also comes with internal compression straps, which have the dual function of not only holding everything neatly in place, but allowing users to squeeze even more stuff into the same space. Those who like to bring everything but the kitchen sink on their adventures will appreciate this feature. But that main compartment is just the beginning of the Shuttle's storage options. There is also a collapsible bottom pocket that is perfect for stashing wet clothing or a pair of stinky boots you want to keep separated from your other gear. Another spacious pocket, hidden away on the rear of the bag, is great for storing dirty laundry as well, while a flap pocket – also on the rear of the bag – is designed for quick access to magazines, books, or even a tablet. Finally, on the top of the Shuttle you'll also discover yet another handy pocket that is meant for keeping your small liquids and toiletries close at hand, both at your final destination and while passing through security at the airport. Other nice touches include grab-handles on pretty much every side of the bag, making it easy to pick it up from any angle. Compression straps on the outside of the Shuttle also work in conjunction with the padded sidewalls to help secure the contents of the luggage and provide stability too. There are even thick, durable protective bumpers along the backpanel to add yet another layer of protection to the contents of the luggage. As a guy who generally likes to travel light – often using only a backpack – it has always been difficult for me to find a piece of luggage that I truly loved. While it is true that I've usually had no problem finding a bag that does the job I require of it, often times there were elements about its design that just didn't sit right with my style of travel. That really isn't the case with the Osprey Shuttle 100, which I found to have all the qualities that I'm looking for – most notably versatility and convenience wrapped in a rugged and durable shell. I found all of that, and more, in this piece of luggage, which I suspect will replace my trusty backpack on more than a few upcoming trips. It doesn't hurt that this bag feels like you can throw everything you need – including the kitchen sink – into it and still have plenty of room to spare. But for those of you that find the 100-liter capacity still isn't enough, Osprey offers the Shuttle 130, which provides 30 more liters of space for those trips when you really do need to bring everything. If you're an adventure traveler who prefers hitting the road with a more traditional piece of luggage rather than a backpack or duffel bag, you'll find a lot to love with the Osprey Shuttle. It offers plenty of carrying capacity, numerous pockets to keep your stuff organized, and fantastic build quality in every area, including the wheels, handle, and sidewalls. This is a bag that is meant to go just about anywhere, and come back in the same condition that it left. But just in case something should go wrong, Osprey still backs the Shuttle series – along with all of ts other products – with the fantastic All Mighty Guarantee. This is one of the best warranties in the business, promising to repair or replace the product if it should become damaged for as long as you own it – full stop. The Shuttle 100 sells for $290, while the Shuttle 130 goes for $320. Those are competitive prices for luggage this good, especially when you consider it will likely be a constant traveling companion for years to come. If you're in the market for a new bag, this is the one I would recommend at the moment. It is tough, good looking, well designed, and can carry a lot of cargo. What more could you ask for?